Monitoring as Code is a concept to define what metrics (functional, performance, architecture) are relevant for applications, services, process, containers or infrastructure. One implementation of Monitoring as Code is what my colleague Thomas Steinmaurer and my friends Matthias Fichtner and Raphael Pionke, from T-Systems MMS, have coined “Performance Signature”. The Performance Signature is a list of metrics including important thresholds stored in a JSON or YAML file. This file gets checked in with your source code and gets automatically validated as your code moves through your Continuous Delivery Pipeline. The signature acts as an automated quality gate between your different stages (dev, test, prod) as well as allows you to validate your production deployments (blue/green, canaries, …). 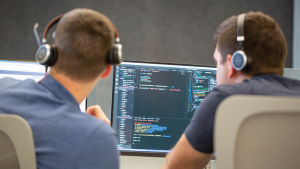 Developers can use it in the Dev Environment to get feedback on every code change. It can be integrated into the Pull Request Approval process before merging to master. It can act as Quality Gates between staging and production after executing your load tests. And finally, it can be used to get Real-Time Production Feedback on e.g: Blue/Green, Canary of Feature Flag releases! When a build is pushed through the pipeline the actual values captured while validating your Performance Signature can be committed back to your source code repo. This not only allows you to historically see the trend of your performance – but also allows you to push these accepted values as your new production baselines. 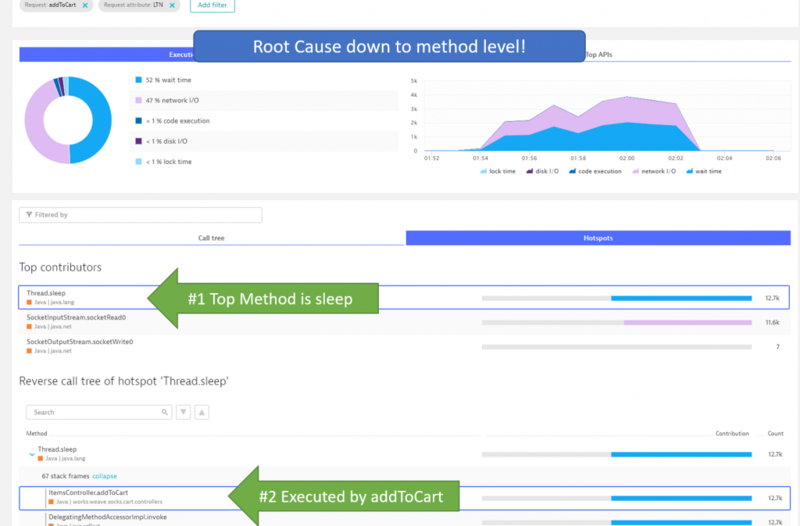 In Dynatrace we provide REST APIs to define your thresholds for your service endpoints or even for resource consumption. We can make this part of the production deployment by applying the thresholds as defined in your source code repo to your production monitoring environment! While the performance clinic video, as well as the documentation on the Plugins GitHub page, should give you all the information you need to implement the Performance Signature for Jenkins yourself, I thought I would write a quick step-by-step guide to better understand the use cases & benefits. First step is to rollout the Dynatrace OneAgent in your environment. If you don’t yet have a Dynatrace installation, simply sign up for our SaaS-based Trial and follow the instructions to deploy the OneAgent on your Linux, Windows, Solaris or AIX machines. If you run on Kubernetes, OpenShift, CloudFoundry, Azure, AWS, GCP … simply follow the instructions in the Deploy Dynatrace OneAgent section. The OneAgent will automatically take care of FullStack Monitoring. Leverage the wealth of meta data information available to properly tag your services, processes and hosts. 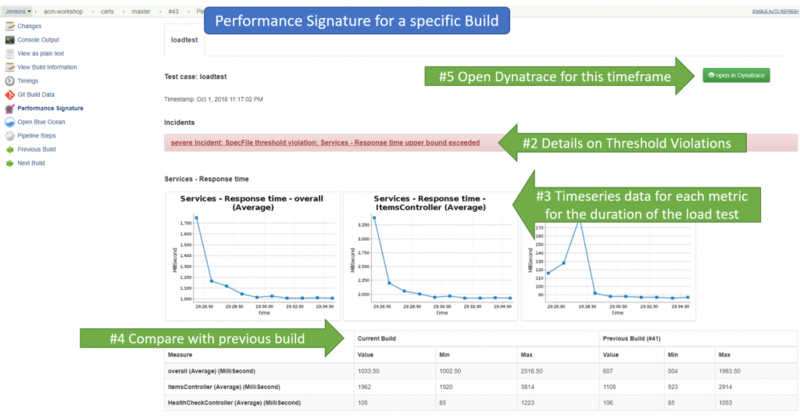 Install the Performance Signature: Dynatrace plugin it via the Jenkins Plugin Manager. In the global system configuration section in Jenkins configure the endpoint to your Dynatrace Tenant. This can either be a SaaS or Managed Tenant. All you need is your Dynatrace Tenant URL, e.g: https://YOURTENANT.live.dynatrace.com and a Dynatrace API Token which you can create in Dynatrace via Settings -> Integration -> Dynatrace API. 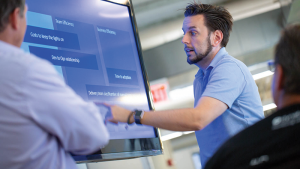 Configure one or more Dynatrace Tenants. 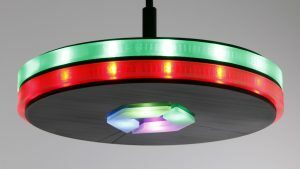 All you need is Dynatrace Tenant URL and the API Token. Simply wrap the deployment with createDynatraceDeploymentEvent. 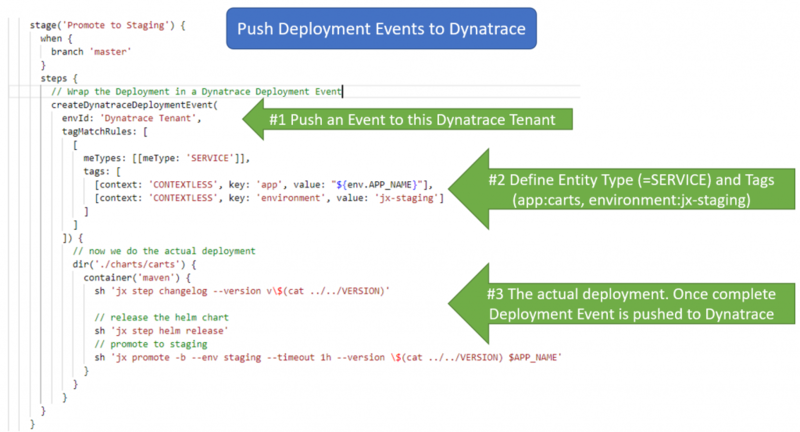 It will automatically create a deployment event in Dynatrace on the matching entities! Deployment Event is automatically pushed containing links back to the Jenkins Pipeline, Build Number and Git Commit. I believe this is the first game changer. Why? Because every time somebody runs the pipeline, either on the master or a dev branch, Dynatrace and Jenkins are automatically linked. 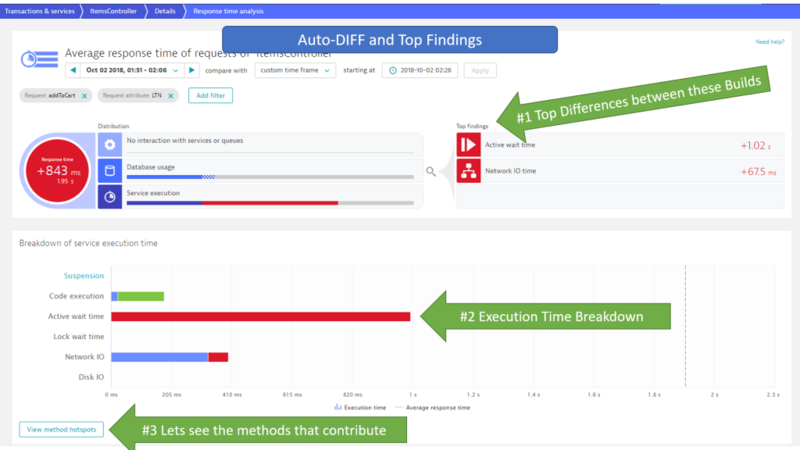 When analyzing data in Dynatrace you immediately know which Jenkins job deployed at which time, what the Git Commit was, how long the deployment lasted, and which services were impacted by that deployment. This step now is straight forward. Simply execute your Selenium, JMeter, Neotys, Gatling, … tests that you normally execute in your pipeline. 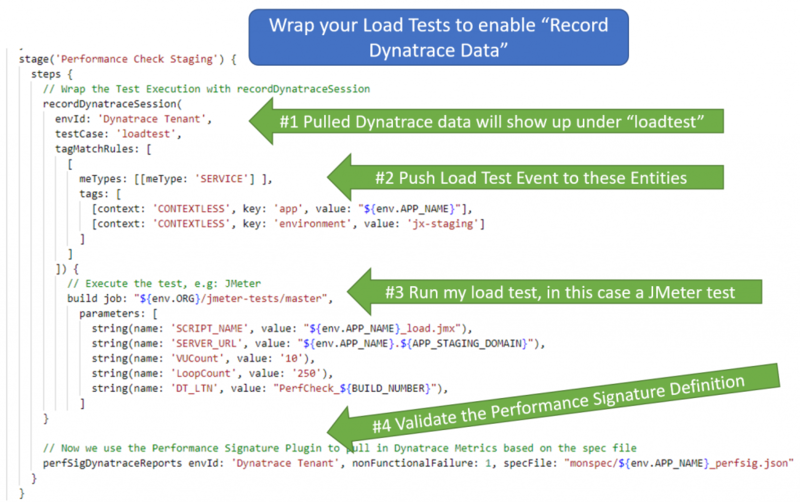 We do recommend that you tag your HTTP-based tests through the x-dynatrace-test HTTP Header as explained in How to I integrate Dynatrace into my load testing processes? This will make it easier to analyze, diagnose and compare individual test runs. The following shows my modified Jenkinsfile for the Performance Testing stage. 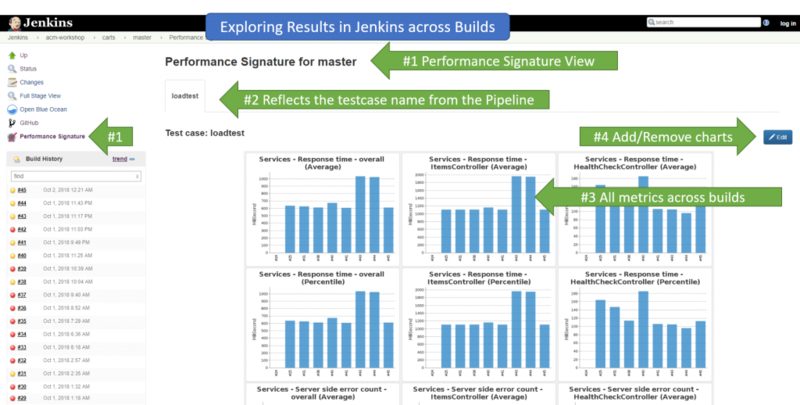 Just as we wrapped the deployment of the application in the previous step we are now wrapping the execution of the performance test into a call to recordDynatraceSession – another pipeline step that comes with the Performance Signature Jenkins Plugin. 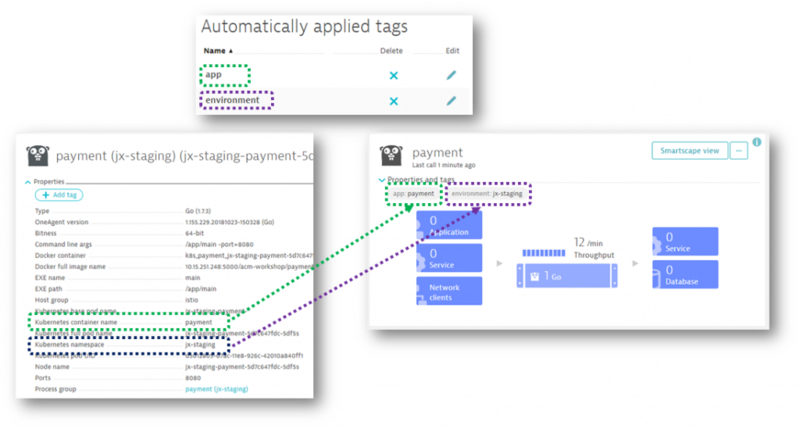 It will push a load testing event to those entities in Dynatrace once the test is complete. It also allows us to define the testCase name which is how data is grouped later on in the Jenkins Result view. You could run different tests, e.g: Load Test, Functional Test, API Test, … – and use that wrapping to pull in different metrics for different types of tests you execute. We wrap the test execution into recordDynatraceSession. This will create a load testing event in Dynatrace and will group the captured performance signature data into the testcase name! recordDynatraceSession goes hand in hand with perfSigDynatraceReports. This is where the “real magic” behind the Performance Signature evaluation happens. Let me show you all the details about this in Step 4! I hope this explains how to use upperLimit and lowerLimit. We might want to rename these though in the future to something like warningLimit and severeLimit as it makes a bit more sense. Now let’s have a look how this gets evaluated and where we actually see the data. I believe this is a game change. WHY? Because it provides Monitoring Feedback as a Service automated into my continuous integration pipeline. As a developer I only have to define the list of metrics I want in a JSON file and everything else happens “auto-magically”. I get notified about performance, resource consumption or architectural regressions (e.g: too many unwanted dependencies) and can then easily drill down to the root cause. Which is what we are going to see next! Yeah – you heard me right – we can also extend this to architectural validations as we can also pull in Smartscape metrics such as incoming or outgoing dependencies! We can either analyze a single test or compare two timeframes with each other! In the screenshot above also see that I have filtered on the request attributed called LTN (=Load Test Name). I am only looking at those requests that come in from my specific Load Test. Now I can select one of the tests that was executed between 1:51 and 2:06 and click on Comparison of one of the tested endpoints! Response Time Hotspot comparison between the two builds shows me that I have a regression involving wait time. Method Hotspots shows me which method has introduced that wait time: addToCart! Depending on what the hotspot analysis tells us we can go off different routes of diagnosing the issue. For more details on diagnostics make sure to check out my Basic Diagnostics and Advanced Diagnostics with Dynatrace Online Tutorial. I want to start to give feedback to Matthias and Raphael by saying: THANK YOU for implementing Monitoring as Code in such an elegant way and making it available through the Performance Signature for Jenkins plugin. If you have more feedback for them either leave a comment on the blog, contribute or post on the Performance Signature GitHub project or reach out via email. Last but not least: We will be doing a HOT (Hands On Training) Day at PERFORM 2019 in Las Vegas called Continuous Performance in a Jenkins Pipeline where we use the Performance Signature Plugin for Microservices deployed on OpenShift. We still have a couple of seats available if you want to register!